Dunaliella seaweed- A unique algae consists of an immense array of minerals, proteins and Lipids. The seaweed’s protein contains almost every amino acid that exists in nature. Proteins and amino acids are extremely important for nourishing and revitalizing skin cells. 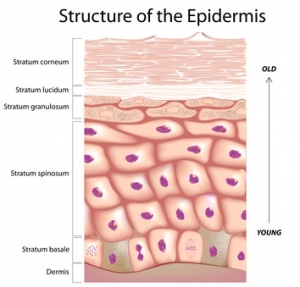 Hypodermis – sub-skin – the innermost and thickest layer of skin, essentially composed of cells that specialize in accumulating and storing fat. 4MIX method – a pharmaceutical method which allows a synergy between the various ingredients that increases the efficiency than each ingredient separately. This method enable our product a longer life time and a dramatically longer product efficiency. Melanin– The Melanin’s task in our body is pigmentation. It is made of grains that contain one or more kinds of polymers of three main types: eumelanin, with a brown-black color, pheomelanin, with red-brown color and neuromelanin, with brown-black color. Eumelanin and pheomelanin are found in the melanin grains in our skin and hair, while neuromelanin is found in the nerve cells in certain areas of the brain. In humans the melanin is mainly useful for protecting the skin from UV rays by swallowing the UV rays and converting more that 99.9% of the rays in a non-damaging way to heat energy. Melanin is produced by special cells called melanocytes, which are found in the bottom layer of cells in the epidermis in the skin, the eyes, the inner ear, and the meninges and in the heart. The melanocytes are capable of producing both eumelanin and pheomelanin. The amount of melanin produced and the ratio between the two types of polymers in the melanin grains are the main factors that determine skin color: a surplus of eumelanin in relation to pheomelanin will result in dark skin and hair color, whereas the other way around will result in red hair.The redness following over-exposure to the sun is a direct result of the damage done to hereditary DNA in the cells, by UV rays. After the damage the dead cells must be replaced with new ones, and to this end more blood flows to the skin. This additional blood flow to the skin makes it possible for the body to provide more oxygen and nourishment that are needed for the dividing cells – hence the red skin. This phenomenon has no relation to the cooling of the body (reddening for bodily cooling occurs after physical exertion when body temperature rises) and the heat felt when touching sun burnt skin originates in the accelerated blood flow close to the surface of the skin, and not from higher body temperature. Redness as a result of exposure to the sun occurs more often with light-skinned individuals. The reason for the higher sensitivity in light skinned people is pinned on the fact that damage to the DNA causes melanin production in the skin, simultaneously executing a system for fixing the DNA in the cell, and eventually that it is impossible to fix the damage, or that the damage is beyond the repairing capabilities of the cell. The cell dies and it is pertinent to copy skin cells to take their place. Lighter complexioned people have less melanin so by the time enough melanin is produced to protect the DNA, it is already damaged and the cells die. Darker complexioned people produce more melanin as a norm, so there is less of a need for production of additional melanin in order to produce enough to protect the cells.There are a number of ways to cause more melanin to be produced, and the main one is by exposure to UV rays (tanning). You can also add to melanin production by consuming foods that are rich in components that are needed for melanin production, such as: tyrosine and copper.Many plants and fruits like apples, avocados and bananas have melanin-like materials when exposed to oxygen but as far as I know the eating of melanin rich foods of all types does not bring on a rise in melanin in the body. Tyrosinase – an oxidase that is the rate-limiting enzyme for controlling the production of melanin. Weismann K, Lorentzen HF. Dermascopic color perspective. Arch Dermatol 142(9):1250 (2006 Sep). Victor FC, Gelber J, Rao B. Melasma: a review. J Cutan Med Surg. 8(2):97-102 (2004 Mar-Apr). Cayce KA, Feldman SR, McMichael AJ. Hyperpigmenation: a review of common treatment options. J Drugs Dermatol 3(6):668-73 (2004 Nov-Dec). Finlay AY. Quality of life measurement in dermatology: a practical guide. Br J Dermatol 136(3):305-14 (1997 Mar). Rendon M, Berneburg M, Arellano I, Picardo M. Treatment of melasma. J Am Acad Dermatol 54(5 Suppl):S272-81 (2006 May). Wolff K, Johnson RA, Szuurmond D. Fitzpatrick’s Color Atlas and Synopsis of Clinical Dermatology. Toronto: McGraw-Hill (2005). James WD, Berger TG, Elston DM. Andrews’ Diseases of the Skin Clinical Dermatology. Tenth Edition. Toronto: Saunders Elsevier (2006). Pandya AG, Guevara IL. Disorders of hyperhyperpigmentation. Dermatol Clin 18(1):91-8 (2000 Jan).Pathak MA, Fitzpatrick TB, Kraus EW. Usefulness of retinoic acid in the treatment of melasma. J Am Acad Dermatol 15(4 Pt 2):894-9 (1986 Oct). Palumbo A, d’Ischia M, Misuraca G, Prota G. Mechanism of inhibition of melanogenesis by hydroquinone. Biochem Biophys Acta 1073(1):85-90 (1991 Jan). Jimbow K, Obata H, Pathak MA, Fitzpatrick TB. Mechanism of depigmentation by hydroquinone. J Invest Dermatol 62(4):436-49 (1974 Apr). Camarasa JG, Serra-Baldrich E. Exogenous ochronosis with allergic contact dermatitis from hydroquinone. Contact Dermatitis 31(1):57-8 (1994 Jul). Haddad AL, Matos LF, Brunstein F, Ferreira LM, Silva A, Costa D Jr. A clinical, prospective, randomized, double-blind trial comparing skin whitening complex with hydroquinone vs. placebo in the treatment of melasma. Int J Dermatol 42(2):153-6 (2003 Feb). Mahé A, Ly F, Perret JL. Systemic complications of the cosmetic use of skin-bleaching products. Int J Dermatol 44(Suppl 1):37-8 (2005 Oct). Griffiths CE, Finkel LJ, Ditre CM, Hamilton TA, Ellis CN, Voorhees JJ. Topical tretinoin (retinoic acid) improves melasma. A vehicle-controlled, clinical trial. Br J Dermatol 129(4):415-21 (1993 Oct). Grimes PE. Melasma. Etiologic and therapeutic considerations. Arch Dermatol 131(12):1453-7 (1995 Dec). Nussbaum R, Benedetto AV. Cosmetic aspects of pregnancy. Clin Dermatol 24(2):133-41 (2006 Mar-Apr).